Need a weekend vacation to an exotic land full of unique creatures? How about some hack and slash therapy with giants begging for a beat down? Well, this weekend is your chance. 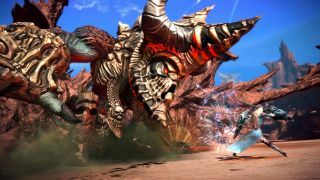 The upcoming action MMO TERA is hosting their forth closed beta test and we're here to help you get a piece of the action. If you're tired of the hot-bar-style combat of the last 10 years, this is definitely an MMO you have to try out. Aside from a gorgeous world and characters, TERA's big feature is combat. Every skill needs to be aimed in order to hit a target, adding an action gameplay feel that is rarely seen in MMOs. Even healers have to step up their game and perform on-the-fly skillshots to connect their wound healing magic with their allies. The CBT lasts from Friday, March 23 at 12:00 PM PDT to Sunday, March 25 at 11:59 PM PDT, so you'll want to grab your code and start downloading today. Note that this is a North American test only. We've teamed up with our pals at GamesRadar to giveaway 500 codes to this weekends CBT. Head over to our shared giveaway page and log into (or create) a GamesRadar account–which quite honestly takes as much time as you just spent reading this sentence. Follow the instructions there, and you'll be in the slicing away at evil all weekend long.